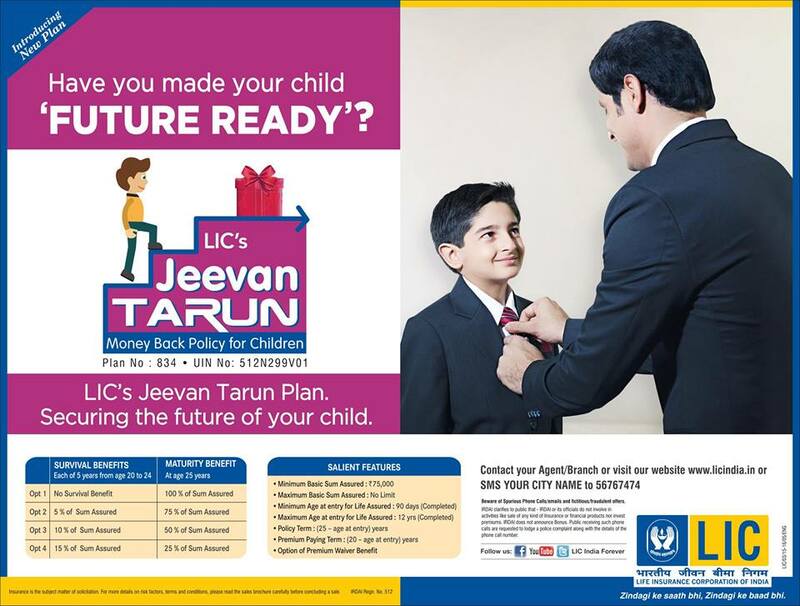 LIC Jeevan Tarun – LIC Jeevan Tarun (Table 834) is children money back plan. This plan is designed to meet various financial needs of children like education, marriage etc. LIC Jeevan Tarun policy is non-linked, with profit money back plan. It is second plan launched by LIC in 2015 for children. Before two month LIC Children Money back plan (Table 832) was launched by LIC. You can read review of this policy here. Let’s check is it worth to buy LIC New Children Money Back Plan Jeevan Tarun or not. LIC Jeevan Tarun is flexible plan wherein depending on the requirement, the proposer can choose any of the four options for Survival Benefit. Payment of this benefit take place from ages 20 to 24 years. Maturity Benefit is payable at the age of 25 years only. Options available for this plan is given below. This option need to be selected by proposer at initial stage while buying this policy. On death before starting risk coverage: Death benefit shall be payable which includes total amount of premium paid excluding taxes. Sum assured on death defined as higher of 10 times annualized premium or absolute amount assured to be paid on death i.e., 125% of Sum assured. 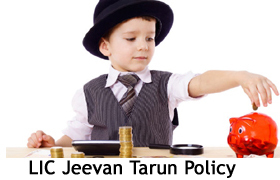 Survival benefit of Jeevan Tarun policy starts at the 20 year of policy holder age. Fix percentage of Sum assured shall be payable every year till maturity of policy (25 Years). These fix percentages will depend on option chosen at initial stage. On maturity of Jeevan Tarun policy remaining sum assured along with vested Simple Reversionary Bonuses and Final Additional Bonus: if any, shall be payable. Where the Sum Assured on Maturity is fixed percentage and depends on option chosen at initial stage. LIC Jeevan Tarun Which Option I should select? Well buying decision for this policy entirely lies on you. From my point of view you should not purchase this policy, however if you decide to purchase LIC Jeevan Tarun policy you should select option 4 as survival and maturity option. If you select other options your money will be blocked for longer duration. Should I buy LIC Jeevan Tarun Policy? LIC Jeevan Tarun Policy (Table 834) seems to be typical money back policy. Before purchasing this policy you should be clear that why you want to buy this policy. Do you want to buy this policy for risk cover? Obvious answer of this question will be NO. Parents will never think of purchasing insurance policy for children. Children are not earning member of family, hence question of risk coverage does not arise. Parents should purchase term plan with suitable amount on their name. Do you want to buy this policy for Educational need? Education expense are increasing every year. Let’s take example you want to make your child engineer and for this you want to make investment. Do you buy LIC Jeevan Tarun for that? If you ask me it is big NO. Reason – Current cost of engineering course is 12 Lac today. This cost is expected to grow at 9% rate. It will be probably 50-60 Lac after 25 years. Do you think that peanut returns of LIC Children’s Money Back plan Jeevan Tarun will be enough for your child education after 25 Years? Looking at experience effective return in this plan will be 6% only. Looking at growing Inflation rate you need investment option which will provide returns in range of 12-15% at least. You should think twice before purchasing LIC Jeevan Tarun Policy. One should explore investment option like equity, mutual funds for child’s education. What is your opinion on LIC Jeevan Tarun Policy? Download LIC Jeevan Tarun Draft Circular by LIC. First of all Congratulation, as you are thinking about future of your child.I recommend to invest in Mutual Funds via SIP route for education of your children.Select balance mutual funds for investment. I am in agreement with you that there is no need for life insurance policy for the children, but please tell me how to secure financial future of children like how to accumulate enough money for their higher education and marriage. Let me know the reason for children are not to having a LIC policy. LIC Jeevan tarun providing insurance for children and premium waiver benefit for the proposer..
You should invest in the equity market and mutual funds. Although these options are risky at long run it will give you good returns.You can also explore other safe investment schemes like PPF,Sukanya Samriddhi Account for children.